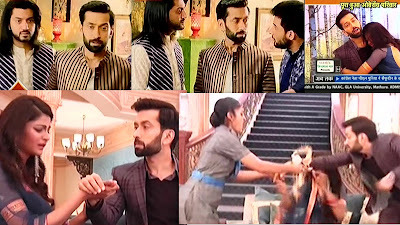 Shivaay-Tia's Roka Ceremony Shivaay Burnt His hand Ishqbaaaz SBS/SBB 22nd June Video WU Written Update. Segment Start from Oberoi Mansion where Shivaay-Tia’s Roka Ceremony is Going On and Shivaay is All Dressed Up for His Roka. Shivaay’s Sister Priyanka comes from London to Attend her Brother Shivaay’s Marriage. Scene Start from Oberoi Mansion where Priyanka Gives Gift to Shivaay One By One She Brought Shirt for Him and Om and Perfume for Dadi and One Whole Suitcase For Rudra.She tells That Rudra’s List was Never Ending So that’s why She had to Buy this Suitcase and Even Paid extra charges for Luggage. Just Then Maid comes with tea and Priyanka’s hand Toches the Cup and Slips But Shivaay Reaches Before Tea Spill on Priyanka He pushes Cup and Tea Spills on his Hand and His Hand Got Burnt. Priyanka Shouts for Water and Maid comes with Jar and Priyanka Puts His hand Inside the Water She asks Him Why He did That His hand is Burnt Because of Her and She cries In Shivaay’s Arm and Shivaay consoles her. Omkara and Rudra come and they Cheer her up By Dancing with her She Gives them their Gifts. In SBB Interview Shivaay tells that Today is His and Tia’s Roka ceremony and His Sister has come to Attend the Marriage. In her Interview, Priyanka Says How Off Screen they did a Prank and She Actually cried because of that prank But She Loves the Unit they all are so Good with her. She also adds that Her Relation with Shivaay is More Emotional and He is So Protective for her. He Burnts His hand to Save me From Getting Hurt.She Also tells that SHivaay Bhaiya’s Roka Ceremony is Today and we will Have so Much Fun. Rudra and Omkara tells How They Cheer Her up But Rudra Narrates that He Teased her for gift But She Said That She Brought Suitcase for Him and Shirt for Omkara. Stay Tune in for More Updates and Must Watch this Segment.